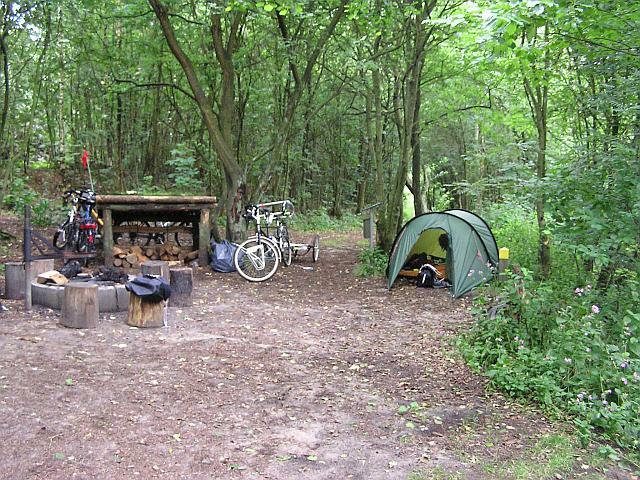 Danmark has a wonderful network of cheap simple campsites catering for hikers, cycle campers, horse riders and boaters. They are specifically not for people using motorised transport. 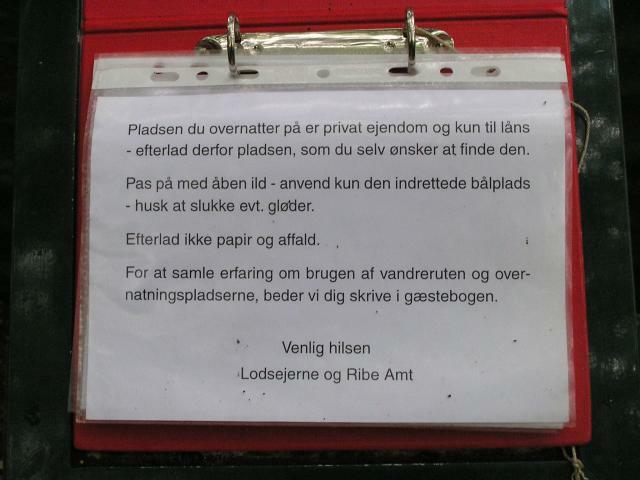 The sites, 751 of them are listed in a publication that can be brought in bookshops or tourist information centres called "Over natning" and lists "Teltpladser" (tent sites) and "naturlejrpladser" (nature sites). In 2005 it cost DKr 98. Note on the Danish cycling maps they list both "Teltplads" and "Campingplads". The later I presume are the bigger commercial sites for all campers motorised or not and caravaners. 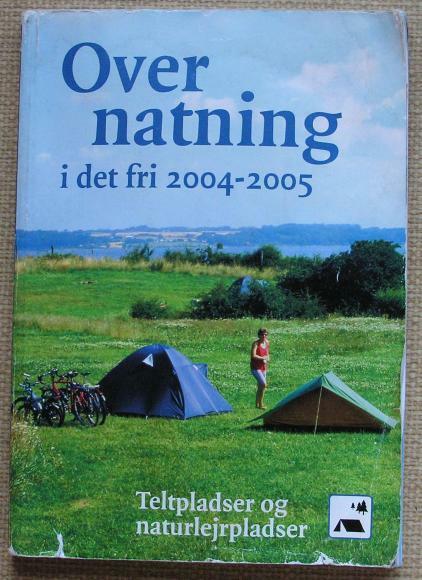 The book "Over natning" is in Danish, with a page that gives some guidance on the sites in English and German. 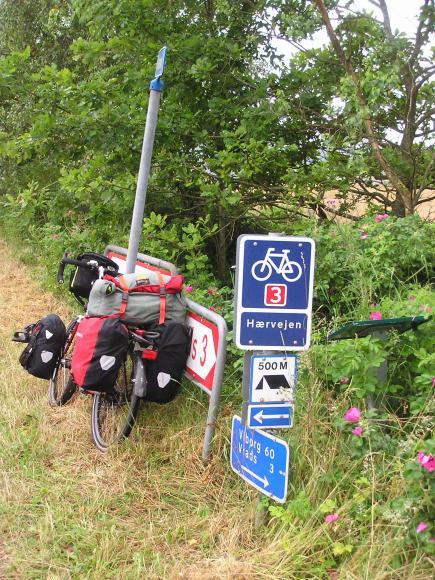 On our cycle tour of Danmark we made full use of the guide and treated our arrival at each site we used as serendipity. 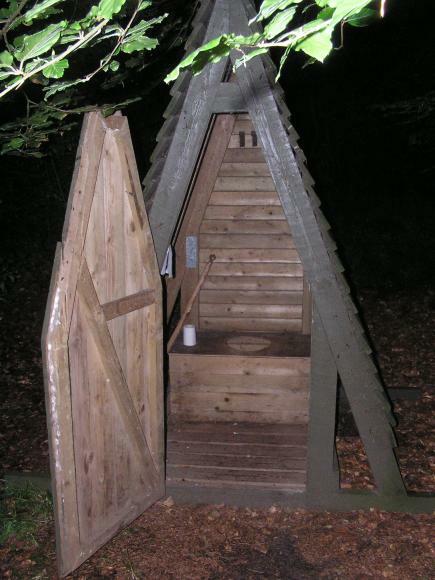 Our first site we used in Danmark, was site 371, Ǻplads ved Karlsgårdeværket, near Varde, about 23 miles from Esbjerg. We had a bit of difficultly finding the site and had to ask. 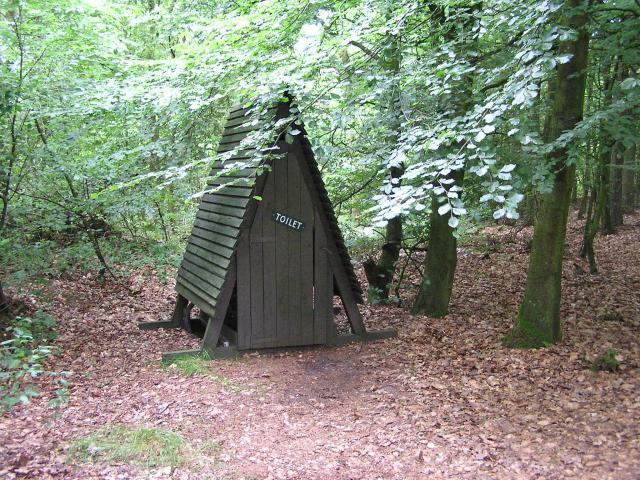 The key thing to ask the locals is for a "primitive campsite". 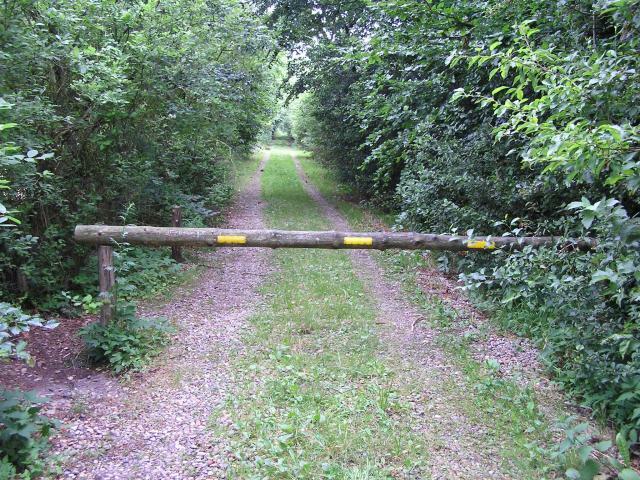 This is the entrance to the site. The water tap is behind where the photo was taken from and the campsite 300 m down the track. Ǻplads ved Karlsgårdeværket, has two pitching areas, this clearing with space for a few tents. And a smaller area a bit further down the track, just above the river Varde We managed to squeeze 3 tents into this area, with the other two to the left of the fire..
Ceri-Siân cooking our first evening meal in Danmark. 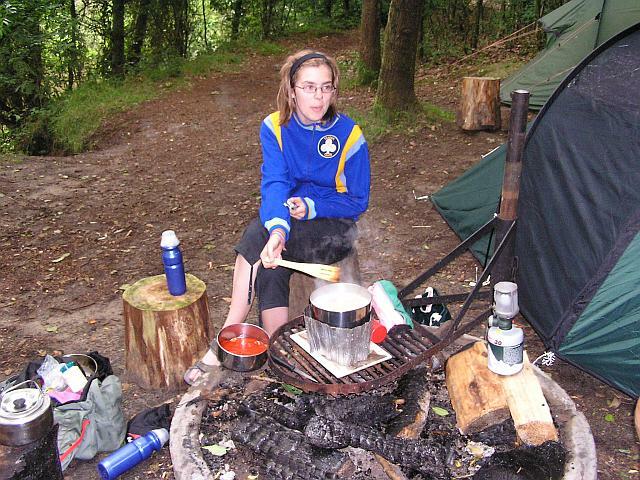 We did not light a fire as we were camped too close to it. Instead we used the heavy cast iron grid as a base for our stove. Having no running water on site. 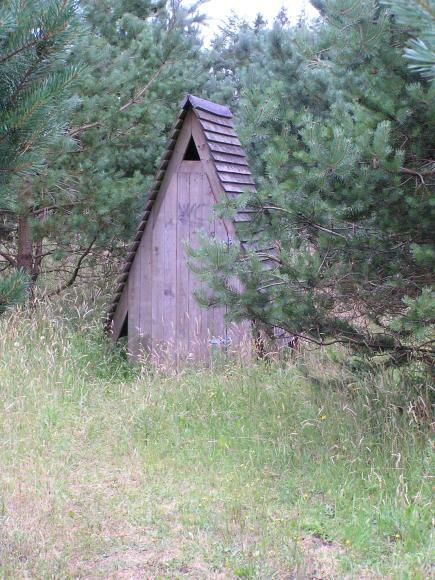 meant that the toilet was an earth closet. They have this nice practical design which can be moved when a new hole is required.. Inside view of the earth closet. 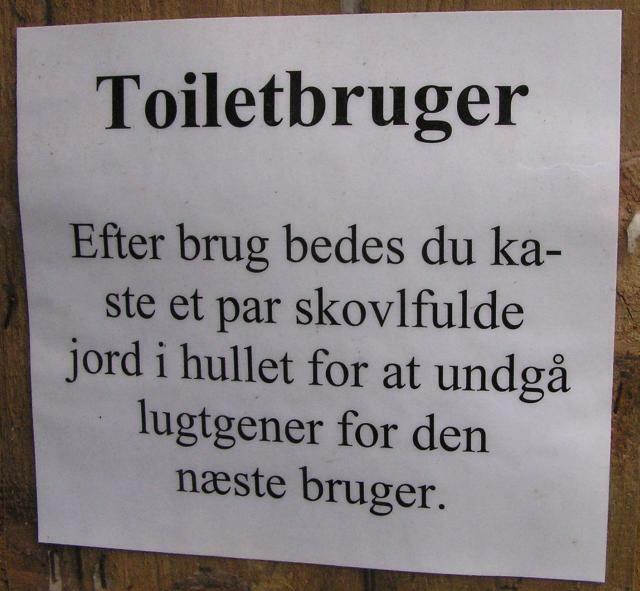 Note that all sites we used provided toilet paper. 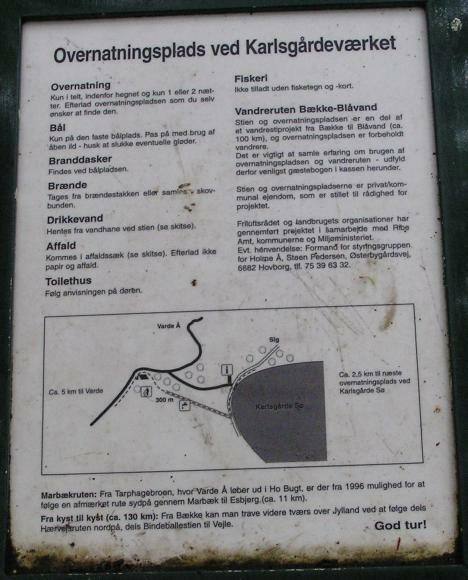 Information board at Ǻplads ved Karlsgårdeværket, which shows the location of the water tap relative to the site. 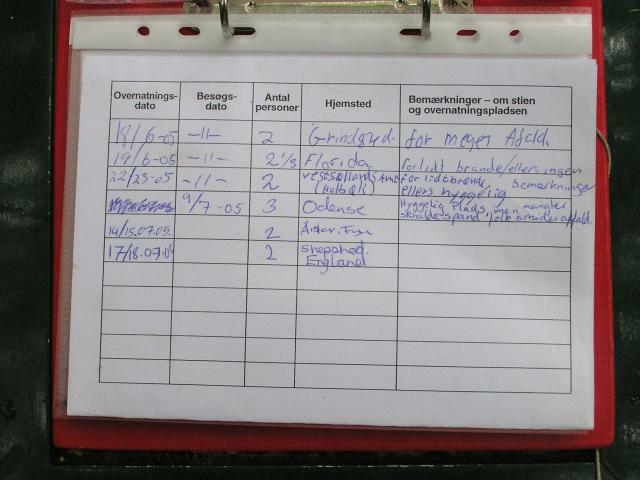 ...and also provided a log book of who had visited, the date of their stay and and any comments. As you can see these sites are used infrequently. The cost of this site - free. See guest book/log book entries for other sites. 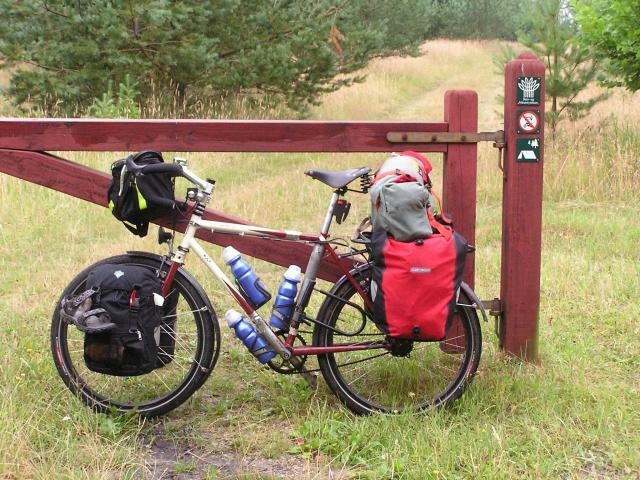 Our next site we visited was another forest site, Skovplads ved Torup Sø, site 321 in the guide. Some, not all sites are sign posted with the little tent sign seen left. 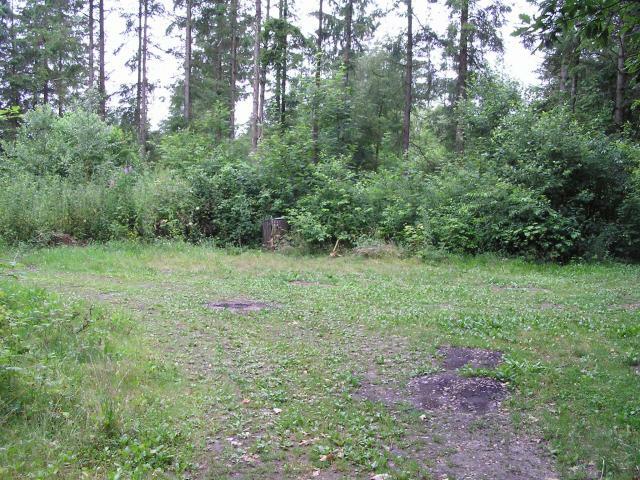 This site is classed as a forest site and has the tent/tree symbol on its entrance. Note the sign prohibiting motor vehicles. Despite being a remote site - this was one of only two sites we met people on the site - they were car campers. 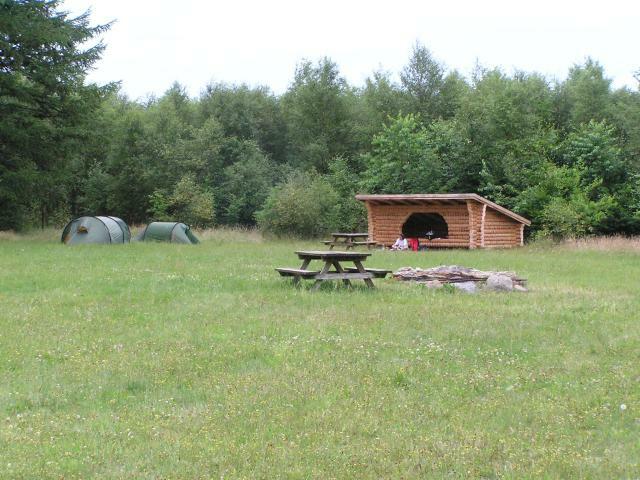 This site had a large camping field, and a brand new shelter that was not indicated in the guide! plus a number of picnic tables and a fire place. 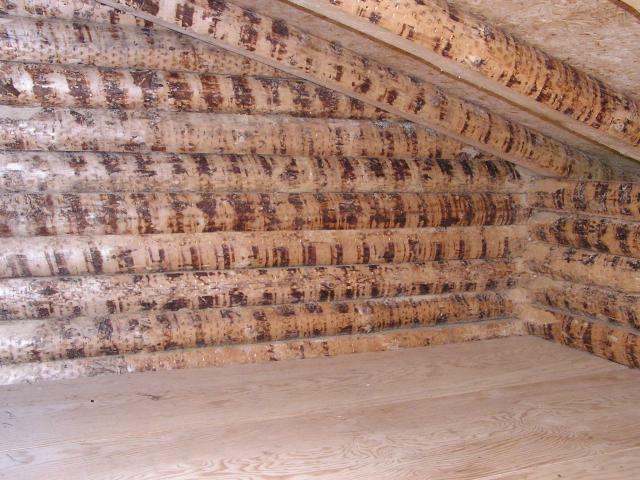 A detail showing the nicely constructed shelter. It was just begging to be slept in - but we whimped out and used our tents. 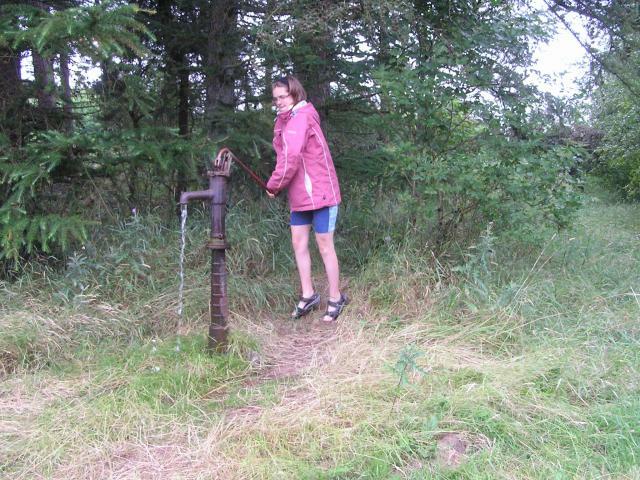 Fresh water was provided at the site, but by an old fashioned lift pump. We boiled the water for drinking just in case. Some sites do not have drinking water and these are indicated in the guide. The earth closet tucked away in the opposite corner of the site to where we camped. 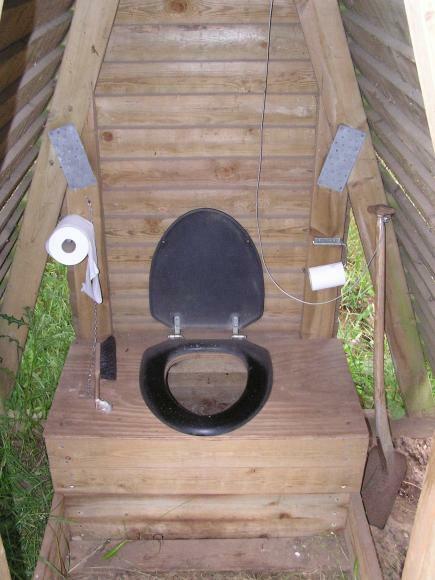 The earth closet was luxury compared with some we came across, note the seat and brush. The brush is to dust off any dirt after shovelling in a load after a dump. After use please be good throw a couple of shovelfuls of earth in the hole for to avoid nuisance smells for the next user."